Fritz and Mike are shown here during FPB's day gig of August 27, 2010 at the Dutchess County Fair in Rhinebeck, NY. Gabe is shown here during FPB's day gig (4th date in a row) on August 27th at the Dutchess County Fair. Members of FPB have a Jager toast with Christina and Jason Mark on August 27th at the Dutchess County Fair. Mike and Fritz present a Jagermeister t-shirt to a Veteran after FPB's evening performance of August 26th at the Dutchess County Fair. Fritz and Frank pose with their friend, Rodney Dunham before FPB's last set of August 26th at the Dutchess County Fair. 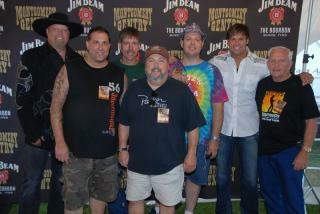 Fritz's Polka Band meets Montgomery Gentry on August 26th at the Dutchess County Fair. Tom, Frank, and Fritz are shown here during FPB's gig at the Dutchess County Fair on August 26th. Gabe is pictured here on August 26, 2010 during FPB's gig at the Dutchess County Fair in Rhinebeck, NY. Tom, Mike, Frank, and Fritz share a Jager toast with their friend, Jason Mark in the evening of August 25th at the Dutchess County Fair. Fritz's Polka Band meets country legend, George Jones on August 25th at the Dutchess County Fair in Rhinebeck, NY. Mike and his customized FPB drumkit on August 25, 2010 at the Dutchess County Fair. Tom and Frank jam along during FPB's gig on August 25th at the Dutchess County Fair in Rhinebeck, NY. Tom is pictured here at the Dutchess County Fair on August 24th. Frank and Fritz are shown here during FPB's second gig of August 24, 2010 at the Dutchess County Fair in Rhinebeck, NY. Gabe is pictured here during FPB's first gig of August 24, 2010 at Woodland Pond at New Paltz in New Paltz, NY.